Kobelco launches new demolition machines to European market - Kobelco Construction Machinery Europe B.V. Following several years of research and development, including valuable feedback from the European market, Kobelco Construction Machinery Europe B.V. (KCME) is pleased to announce the launch of the all-new SK400DLC-10 and SK550DLC-10 demolition machines. The versatile new models, which feature Kobelco’s proven NEXT system for both high elevation and foundation demolition work, provide a safe and quick solution for the assembly/disassembly of attachments and maintenance and enable easy transportation between projects, for significant cost savings. Kobelco is already a market leader for demolition equipment in Japan, and chose the BAUMA exhibition in 2016 to showcase its NEXT Series SK400DLC-9 to the European market for the first time. Feedback obtained from dealers, customers and operators over the next 12 months combined with an increasing demand for demolition and heavy machinery, led to the further improvement and development of the machine before its official launch. The next generation Kobelco SK400DLC-10 and larger capacity SK550DLC-10 are now set to lead the way in high performance building demolition equipment in Europe. The Kobelco SK400DLC-10 is based on the highly acclaimed SK350LC-10, sharing the same turbo-charged Stage IV-compliant engine and hydraulic system for high performance and low fuel consumption, while the SK550DLC-10 is based on the larger SK500LC-10. However, utilisation of the Kobelco-developed NEXT system means that the machines can also be adapted for multiple applications on the job site, including high elevation demolition projects as well as breaking up foundations. The NEXT ultra-high attachment is best suited to the demolition of multi-storey buildings from ground level. Both the SK400DLC-10 and SK550DLC-10 have four ultra-long attachment configurations and can work to a maximum height of approximately 24.7m and 27.5m respectively. The separate boom configuration is ideal for tackling the lower floors of tall buildings where the concrete is at its thickest. The maximum working depth of the SK400DLC-10 is 6,210mm, while the SK550DLC-10 can work to 6,260mm below ground level. Each boom attachment is reinforced for increased durability and reduced structural fatigue, and has a block structure that simplifies the assembly/disassembly process in order to reduce downtime on site. Attachments are connected by hooking the upper (backside) pin to the opposite pins on the lower side – the pressure release to pin fixing can be completed quickly and safely. All attachment joints have the hydraulic piping mounted to the side for easier access and maintenance. Also contributing to the machine’s longevity, the top plates of the booms have neither been drilled nor welded to avoid additional stress, which is a result of Kobelco’s extensive experience in the Japanese demolition market. Another important benefit of the NEXT system is the low storage height of the ultra-high attachment when collapsed. This attachment is designed with the jib and arm cylinders crossed over the shorter inter arm, while the back of the arm remains flat. As a result, the height of the attachment in its stored position is approximately 2m, which means that it can be transported between projects on a standard trailer, saving significant logistical costs. Other factors contributing to easy transportation include a hydraulic extension/retraction mechanism, which can reduce the width of the crawlers to approx. 3m in compliance with some strict European transport regulations, and the two-part counterweight, which can be separated more easily than an integrated counterweight. 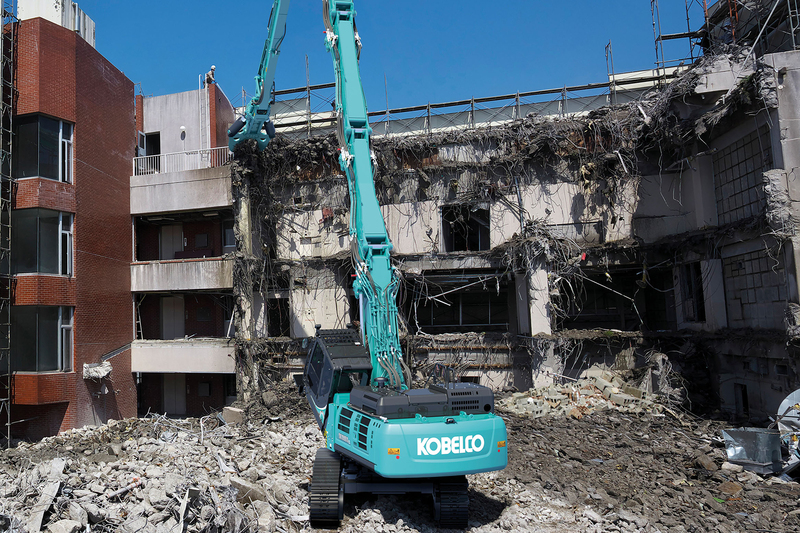 Demolition job sites provide challenging conditions for the operator, so Kobelco has worked hard to develop the SK400DLC-10 and SK550DLC-10 with increased comfort and safety in mind. The demolition-specification cabin, which is compliant with FOPS level II, can tilt up to 30-degrees so that the operator can maintain a comfortable posture during high elevation demolition work. In addition, the operator can enjoy an unobstructed upward view due to the pillar-less design, while parallel windscreen wipers and washers on both the front and top windows contributes to optimum visibility. Cab guards can also be opened for easy maintenance of the windows. Other important safety features on these new models include the new cab interference prevention system, which sounds an alarm and prevents the machine from allowing the working tool to come into contact with the cab during operation. In addition, the working radius and stability of the machines are calculated from the position of the attachment and the operator is warned with an alarm when stability is compromised via the stability warning system. The SK400DLC-10 and SK550DLC-10 are also equipped with rear view and right side cameras, a loudspeaker system, falling object deflector and bright, long-life LED lights for increased visibility on site.